“I want to become an actor!” said the younger one while the elder one kept quiet. It has been a pretty standard answer for him for almost as long as I can remember. “What about you?” I kept prodding the elder one. “I am not sure...”, he said. “You should start with your interests. Don't ever get into something which doesn't interest you!” I let out a pearl of my wisdom. He paused for a few seconds and said, “Video games, sports and cooking.” He seemed to be sure of his answer. In the two minutes before we reached home, the younger one started narrating his movie screenplay. I had dislocated my left thumb for the second time. This time it was a game of football during a substitute P.T. period at school. I was the goalie. JVB kicked the ball. I tried to defend it with my left hand. The ball hit my thumb and I knew immediately that it had dislocated. I felt a sudden rush of panic that was immediately overwhelmed by the feeling of failure to defend the goal. I kicked the ball and continued play as if nothing happened. Later that evening, I told my mother. My father took me to our family doctor. He called the visiting orthopaedist, the same doctor who fixed my thumb earlier when I got it dislocated trying to ride my bicycle hands-free on the road off Poonamallee High Road that led to the old Naduvankarai bridge. I learnt two lessons that day. One - don't try to steer the bicycle with your leg, especially when you are driving hands-free downhill. Two - you will never forget your first dislocation however old you get. We left the clinic and my father started his faithful maroon Bajaj M-80. I rode pillion. Just as he merged into the traffic on Poonamallee High Road near the toll-gate bus stop, I hear a bang. A second later, both of us are thrown off the vehicle. Half a second later, I see the rear wheel of the speeding Tempo that hit us just a few inches away from my face. My whole life flashes before me. The Tempo screeches to a halt. I come to my senses and look around. My father is down on the ground. He had a few minor scratches. I feel a shooting pain in my right knee and toes. My pinky toe had its nail ripped and my knee had a bloody gash about an inch wide. I was a bit dazed from my near-death experience. We went back up to the doctor and he treated our wounds. My dad worked as an accountant at a government-owned organization. The accounting department got two brand new IBM PCs from the head office. One of them was an IBM PC XT with a monochrome CRT monitor and another was an IBM PC/AT with a color VGA CRT monitor. You booted those monstrosities with a 5¼-inch floppy diskette MS-DOS operating system. My father was the go-to guy on computers in that company because he could do spreadsheets (Lotus-123, anyone?) and knew Ashton Tate's dBase III+. He was the go-to guy for me for three reasons. One - he let me type the school projects using Wordstar on those machines and fire up the dot-matrix printer and look at it with awe as it rattled away (and I just loved greenbar continuous stationery for some Freudian reason); Two - he let me work on Harvard Graphics Presentation or the extremely popular Banner software and go crazy printing text in cool fonts (Did I say I loved continuous stationery? ); Three - he always let me play Prince of Persia and Chess on those computers. So, when I took the Biology/Math/Physics/Chemistry/English group in class XI, I volunteered to get our class notes for “The Human Reproductive System” printed. Due to time constraints this was typed by my dad's colleagues in record time so that our class could meet the deadline. The first and only choice I made, when I couldn't get into medicine and chose to pursue engineering instead, was Computer Science & Engineering. Instead of class notes, it was now slides for technical papers created with Harvard Graphics Presentation on Overhead Projector film. I think I owe it to Prince of Persia and my dad for being able to tell my son today that he can become a gamer, if he wants to. The first audio cassette player I used was a Sanyo. It was a cassette recorder with a built-in microphone and a mono player. My uncle bought it and it was in my grandmother's house. It was the year when Mouna Ragam released in the Grand Theatre in Annanagar, the first Tamil film in a theatre that ran English films and directed by a new director named Mani Rathnam which went on to become that year's biggest grossing film. The same year saw the release of Punnagai Mannan by K. Balachander starring Kamal Hassan. It was widely publicized as the movie in which Ilayaraja, the composer used the MIDI synthesizer to bring computer music to the Tamil film industry, believed to be operated by A. R. Rahman. Oomai Vizhigal was another hit movie that year, a film written by Aabhavaanan and directed by R. Aravindraj, starring Vijayakant. But there were three reasons why the film that is etched in my mind from that year was Vikram, another Kamal Hassan starrer. The first reason—the story and screenplay was by my favorite writer Sujatha. The second reason—it had Vanithavani,vanamohini…, a song considered too risqué at that time that Oliyum Oliyum, a program that was telecast every Friday by the state-run Doordarshan TV (Channel 4), never showed it. It was a song that a trio of friends secretly sang in the back benches at school while the teacher was busy with the lesson. The third reason was the beautiful Dimple Kapadia who was brought from Bollywood to act in that movie as a princess of an exotic land. Remember the Sanyo cassette player that I started with. The very first recording I made using it was songs from the Hindi blockbuster movie, Bobby from many years earlier, starring Rishi Kapoor and Dimple Kapadia. That was the first time that I saw Bobby and instantly fell in love with it, the same way that Rishi Kapoor's character is enamoured seeing Dimple's. The movie was telecast by Doordarshan and I meticulously taped every song. A Sanyo cassette player, Bobby, Dimple Kapadia, Vikram—the universe conspires to design your fate. That moment marked my unofficial introduction to music. My school had co-curricular activities every Thursday and I had signed up for Yoga. After a year, I felt that I should switch because I felt the other kids were having too much fun while I was stretching my body into uncomfortable poses. We also had a guitar club that sounded cool and I decided to join. When I told my mother, she asked me if I was really interested. I answered affirmatively. 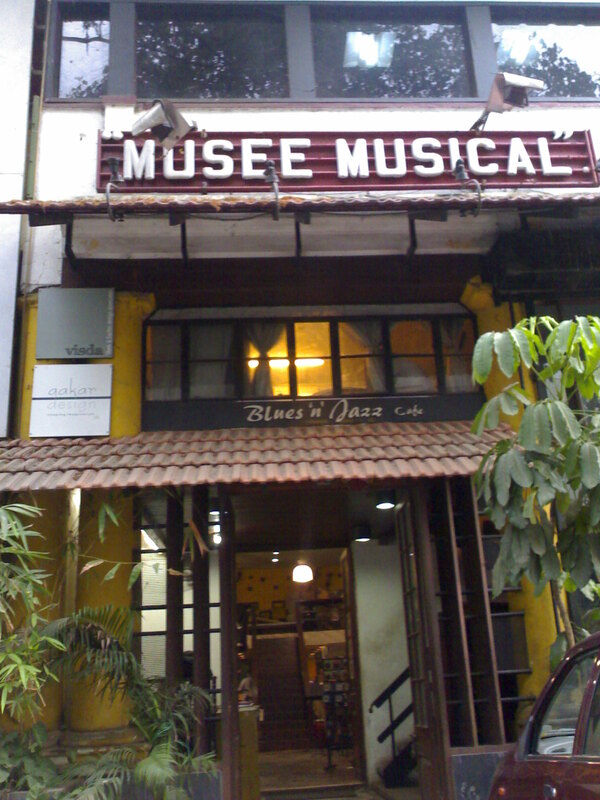 The next week she took me to a quaint shop in Mount Road called Musee Musical. I instantly fell in love with that shop. There was an old-world charm to that store. They had violins, guitars, drums, flutes and every other musical instrument that I had seen before in my life. I got myself a yellow Givson guitar. It cost 650 Rupees and the salesman gave me two complimentary picks. My mother and I returned home in an autorickshaw. I held my Givson carefully as the autorickshaw navigated the potholes in the Madras roads. Our guitar teacher in school started with music theory, treble clef, bass clef, notation etc., One day, someone brought a leaflet for a CASIO electronic keyboard that had numbers instead of the notes and was playing Jingle Bells using it as reference. Initially, the teacher was smiling and walked up to that boy. When he discovered that he was playing it from that leaflet that didn't have notation—an abomination to say the least—he was horrified. He went into a rage tearing it apart and throwing it into the trash can. On another instance when he found three of us talking during class. Saravanan was my classmate and the other one was a junior student. I vaguely remember his name as Ravi. He asked each one of us to make a fist and knock the other's head with our knuckles. The first one to get struck was Saravanan and the Ravi was to do the deed. It was my turn next to strike Ravi and then Saravanan was supposed to strike me. I had to think quickly to escape, so I did the unexpected. I rolled my right palm into a tight fist and gathered the maximum strength that I could and struck Ravi hard on the center of his head! It must have knocked the living daylights out of him that he immediately began crying, tears flowing uncontrollably down his cheeks. The guitar teacher was stunned and didn't know what to do. He asked me why I hit him so hard. I just shrugged and told him I just did what he asked me to. He then ordered the three of us to get back to our seats and consoled the boy who was wiping his tears and stroking his head. I don't think Ravi ever spoke to me after that. I continued in the guitar club for the next two years and then my interests shifted to dramatics. The guitar gathered dust at the corner of my room except for the occasional time when I would feel like strumming. After I finished college and got into a job, I gave my guitar away to one of my younger cousins. That was my brief brush with music. A decade and a half later, I am a happily married family man with two sons. My wife wanted to wean them away from TV by putting them into—you guessed it—music class! Both the boys learn Classical Carnatic violin. A random thought crops up in my mind and out of a whim, I ask my wife. She says it is never too late to learn anything. A week later, at the insistence of my wife, I register for guitar classes at the same place where my sons go to learn violin! On the first day at class, my classmates are a couple of college students and a school-going boy and girl, just a few years older than my sons. It was a true Vasoolraja MBBS moment for me. The first day was just basic theory. At the end of the class, the teacher instructed the little girl to bring her notebook during the next class and then turned to me and asked me to copy the lessons from her. Jokes apart, I was truly thrilled that I decided to learn the guitar. There was only one thing left. I needed a guitar before the next class. I was very excited about the thought of buying a new guitar. I wanted to take my family with me to the store. Unfortunately, our washing machine broke and my wife said she needed to stay home until the technician finished fixing it. Luckily, he came early and she was on board for the trip to the store. My younger son loves shopping, so he said he would join. I told my mom that we are going to the store and she asked me if I want her to come. Not to be left out, my brother and his wife also join the group and off we go to the store! Madras is now Chennai and Chennai Metro Rail is busy digging up Mount Road for laying the tunnels. Policemen on horseback are crossing Mount Road at the Walajah Road / Mount Road signal. We take a U-turn on Walajah Road and come back to Mount Road. 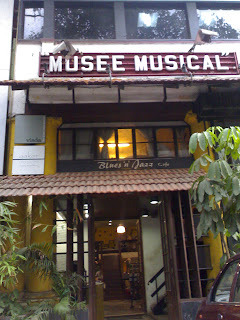 Almost twenty-five years later, after asking directions from a bookseller who had set shop on the sidewalk, we arrive once again at Musee Musical. The store looked very different from what I recollect from my memories. I select my guitar. The salesperson tuned it and gave me two complimentary picks and a guitar belt. We took pictures at the store. Minutes later all of us are on our way back home. I am sitting in the front passenger seat of our car holding on to my guitar firmly as the car bumps a little. Damn potholes! Based on two very different blogs by yours truly, and drastically adapted and written as a play by Naren Weiss and uniquely shot as a short film by Ashwath Nair - Presenting, Triggers on a Leash! The original short stories on which this short film is based are here on Storywheel. Enjoy and share the joy! This is a stub for the 50th story on Storywheel. See Contest Rules for details. Do you want to win a Free EBook? Rules: Please limit your comment to 3 sentences or 30 words, whichever is shorter. This is more a guideline than a rule. But remember that if there are ties in selecting the winners, I will use this rule to break ties. End date: This contest is open until Midnight Indian Standard Time Feb 29, 2012. Winners will be announced within 48 hours of closure of the contest. UPDATE: This contest is open-ended and perpetual. Winners will be announced monthly. Legalese: By participating in this contest, you are granting the rights to Giri Vijayakumar (Author) to write and publish a story using that idea, regardless of whether it is one of the 3 selected winners. You also represent and warrant that the idea is your own and not plagiarized. Stories may be published in the Storywheel blog, digital ebook(s) or print books. Winners will be credited by providing one link to their blog or website at the Storywheel Collaborators page. Wishing all Storywheel readers a very happy and prosperous New Year 2012! As the year draws to a close, here is The Best of 2011 from Storywheel. This list is in order of my preference, so the first one is what I like the most (Sorry, David Letterman. This is my blog and I get to do my lists, my way!). This is top of the list of stories for 2011 and deals with guilt. One of my personal favorites. I have a fascination for train stations and this story opens with a railway station scene. This is a fictionalized account of true events from twenty years ago... the part about Hindi movies. Pure fiction. I loved writing this story and coming up with a totally twisted ending. The train was not crowded for a Tuesday morning. Velachery station was next and a few minutes away. I was sitting on a seat near the door and noticed the commotion behind me. A man had fainted and the passengers clamoured to make him lie down. He was about thirty-five years old, dressed in a T-shirt and jeans. “Please! Make way... I am a doctor. Let me take a look at him!” I said. I checked his pulse. He was still conscious, breathing irregularly and looking dazed. Small beads of sweat appeared on his forehead. I handed him a bottle of Fanta I had with me. The train was approaching the station. He sat up and had a few gulps of the Fanta. He seemed to feel better. The train stopped. I joined the other passengers who got down at that station. I would have just taken a few steps when I heard him calling me. I hesitated, looking at my watch. I still had forty minutes before my meeting with my insurance agent. “On second thoughts... Let's go. There is a restaurant right outside the station,” I said. The man appeared visibly pleased that I agreed. We reached the restaurant. He ordered a masala dosa and I had coffee. We talked about each other. He told me that he was looking for a job and hadn't found one in the last two months. The waiter brought the bill. I reached for my wallet and was shocked to discover that it was missing. He placed my wallet in front of me. I glanced at my watch. Coach Singh was still answering a question from a reporter from The Sydney Morning Herald. The press conference should be over in a few more minutes. I looked around the room full of sports reporters covering the London Olympics. I stopped when my eyes met hers. She looked familiar. Who was she? “We are quite confident that our champion boxer Sibi will win the Olympic gold. He is fully prepared and in excellent form. That is all we have time for today!” The coach turned to me and I nodded in agreement. We got up. The cameras clicked incessantly as we left the conference room. I ran into Anwar Mubarak, the Egyptian I was going to face tomorrow in the finals. He was in great form too and a formidable opponent. I waved to him and smiled when I noticed the woman from the press meeting walking towards me. I couldn't contain my surprise. I inhaled deeply. Here she was... the girl I had a crush on during high school. Beautiful as ever, maybe even more now than what I imagined her to be. The mild fragrance from her perfume hit my nostrils as she stood inches away from me. It brought back memories of how madly crazy I was about her back in the days. We grabbed our drinks and settled down at a table at a relatively quiet corner of the bar. My phone rang. It was the coach. I excused myself and stepped out to take the call. I returned a minute later. “You didn't want to talk shop...” She reminded me. “No... Still looking for the right man.” She smiled. “Oh, that's a shame...” I said sipping my drink and looking at her dark black eyes. She was quiet. I felt that familiar feeling of butterflies in my stomach. We talked for thirty minutes about everything except what I wanted to tell her. I couldn't muster the courage to tell her how much I loved her. We shook hands. She left. I returned to my room. I closed the door behind me and banged my head lightly a couple of times and stood there cursing myself. I stared at the Olympic Gold medal that was mine from yesterday's fight. I had knocked out Anwar in the third round to grab the gold. I couldn't believe it was being stripped away from me! The morning newspapers lay in front of me. All of them carried the news about the doping scandal. They reported that high levels of the banned substance 4-hydroxytestosterone was found in my blood and urine samples taken before the fight. The official letter from the Olympic Committee banning me from future fights lay on the table. I felt as if someone grabbed my heart inside my chest and crushed it into a million pieces when it dawned on me that the girl I loved from high school had spiked my drink. Storywheel turns two today. I would like to thank all the regular readers for their support. When I started posting my stories on Storywheel, I had taken on the goal of completing 100 short stories in one year. That goal is far from being complete. As of the second anniversary, I have written 47 stories. Still short of the half-way mark. Nothing captures this better than the last story that I posted titled Unfinished Business. The last year has been quite eventful. I wrote a total of 9 new stories. The pace has definitely slowed down. I am hopeful that I can pick up the pace and finish a few more before 2011 ends. I did my first radio interview with Sanobar Sultana on Chennai Live, mostly about Storywheel. In July 2011, I published the first 40 stories as Storywheel Collection ebooks on Kindle. As of today, the Storywheel Blog's Facebook page has 184 fans/followers. As always, thank you for your support. Spread the word. Prakash looked at his watch. It has been more than forty minutes since the scheduled departure time for his flight. There was no sign of the aircraft leaving the departure gate. The cabin was getting warmer. The flight attendants were busy handing out water bottles to the passengers who were getting increasingly impatient. The PA system came alive with the captain making an announcement. The passengers got up murmuring and lined up to get off the plane. Prakash was concerned about missing his connection flight to London from Mumbai. He was on his way to attend a due diligence meeting with a potential acquisition target that his company was considering. The flight touched down at Mumbai airport almost an hour and half delayed from what Prakash had planned. As soon as he got out, he headed towards the shuttle bus service to get to the international terminal. There was a small queue waiting there for the shuttle. Prakash was getting nervous about making his flight as he reckoned he would reach there less than thirty minutes prior to the departure of his London flight. The agonizing wait was finally over as the passengers boarded the shuttle bus. Prakash got down from the shuttle at the international terminal and sprinted to the check-in counter. He was surprised that the check-in counters were all empty with no one at the desks except at one where a supervisor was finishing up her shift. He ran to that counter before she could get away. Prakash was getting angry. But, he also realized that the only person in the entire world who could help him get on that plane was the lady in front of him. The lady looked at him for a second of hesitation and then picked up the phone. Prakash let a sigh of relief. Prakash picked up his hand luggage and ran towards security. He thanked his stars for packing light without any check-in bags. The security lines were also empty. He breezed through it and ran towards the gate hoping to make it on time. He finally reached the gate. The last three elderly passengers were boarding the plane. Prakash finally was relieved. He stood at the end of the line wiping the sweat off his face. A few minutes later, he was well settled in his seat smiling at the flight attendant who was serving him a welcome drink. The television channels were running the news about the crash non-stop. A red bulletin in the bottom of the screen announced a toll-free number that relatives could call to inquire status. The nation was shocked and sadness filled the air. No one expected any survivors from the crash. So, it was indeed a miracle that one person out of the four hundred plus passengers on that fateful flight lived to tell the tale. The alarm sounded signaling the end of the hour. The watch tower had a change of guard. Superintendent Jackson had tightened the security protocols after the riot that broke out two days ago. One guard had been killed in the violence. Some said Jackson was pissed at the thought of such an atrocious incident under his watch. There were others who had a conspiracy theory that Jackson staged the whole thing to get rid of the guy for reasons unknown without having to face a departmental inquiry from the Bureau. Jackson was a short and stout man with his balding forehead. One would mistake him for a store-clerk or a restaurant waiter except that the nasty scar that ran down his right cheek was evidence of a much darker character. He cut his teeth as a gunnery sergeant in the wars and joined law enforcement after leaving active service. He specifically asked for a job within the Bureau of Prisons and was granted it without much difficulty thanks to his war credentials. Now, he runs the Lunar Penitentiary Colony where the worst offenders are shipped off from the Earth to lead life sentences. Jackson ran a tight ship and held an enviable record. No one has ever managed to escape from his prison, yet. Jeff Rhodes a.k.a. Prisoner #3092 at the Lunar Penitentiary Colony, lay on his bed in his cell with palms locked behind his shaved head and looking up through the glass ceiling. Beyond that reinforced unbreakable glass ceiling were stars, distant galaxies and dark space that seemed to extend to eternity. Somewhere, definitely outside the small viewport that the ceiling in his confinement cell offered him, a beautiful blue marble called Planet Earth was spinning around. Jeff Rhodes dreamed about it all the time. If everything were to go as per his plan, he would be on his way to the Earth in less than twenty four hours only happy to leave this godforsaken place. He turned to his side and caught a figure in the shadows, standing by the gate and staring at him. He could make out the unmistakable contours of Jackson in the darkness, standing there almost like a wax statute. Jeff closed his eyes and mentally started running through the sequence of his escape plan for the tenth time. He didn't know when the tiredness took over his body and when he fell asleep. Blaring alarms. Flashing lights. Prisoners lining up for a roll-call. Jeff avoided eye contact with Jackson and the other guards. He sat alone during breakfast, looking up occasionally to count the number of guards on duty. He knew that one of the guards was on special leave and had left for Earth last week due to the untimely death of his wife. Jeff had taken care of killing another guard during the riots last week. The reinforcements sent by the Bureau were enroute and would take two more days to reach the moon base. Meanwhile, Jackson's short-staffed crew would make mistakes. Jeff was counting on it. He hoped that no one would notice him slipping away after breakfast when the prisoners are sent back to their cells. The alarm went off and the prisoners got up from their seats and filed into two lines. One of the guards signaled them to move towards the cell block. The prisoners in their orange jumpsuits started walking. Jeff had carefully picked his breakfast table so that he would be towards the end of the line with just a couple of men behind him with the rear guards following them. The prisoners had to navigate two sharp turns and Jeff was planning to slip away between those two turns and hide in a wall recess he had identified. The challenge was to do it without the knowledge of the other prisoners and the rear guards. The leading prisoners made the first turn to the right. Jeff coughed and stopped temporarily as the rear guards looked up. He avoided meeting them in the eye and let the two other prisoners who were behind him to pass and took the last position in the line. The guards didn't notice and seemed to be relaxed and engaged in trivial banter. He was now just a few steps away from the first turn himself. Jeff made the turn and quickened his pace. Small beads of sweat formed on his head and ran down over the dragon tattooed on his neck. The rear guards were invisible and were at least ten steps behind him. Another four seconds... and he would reach the wall recess. As soon as he got there, Jeff deftly moved sideways and cramped himself into the small space offered by the wall recess and hid in the darkness. He could hear the footsteps of guards. Jeff was acutely aware of all his senses and time seemed to slow down as he waited with bated breath. He could see the rear guards passing by. He waited there for a minute and then tiptoed his way to the transportation bay. He reached the door. There was not much time left. There will be a check done after all the prisoners get into their respective cells and his escape would be discovered. He had to be on his way before that. He took out the key from his pocket... the key that he had taken from the dead guard during the riots. He opened the transportation bay door. He had almost made it. A few seconds away from freedom. He could sense it. A steel casket ready for dispatch lay in the center of the dimly lit room. The casket held the dead body of the guard he had killed. It was destined to leave for the Earth in the next robotic cargo freighter out of the Lunar Penitentiary Colony. Jeff thanked the broadminded designers of the steel casket for making it large enough to fit two bodies. 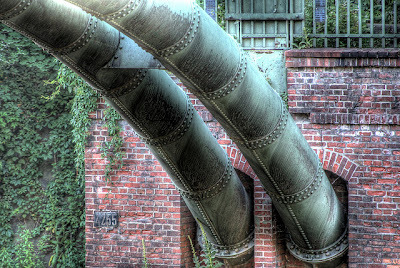 Of course, he didn't know or care that it was designed that way for saving costs. He could see the cargo freighter's lights blinking a short distance away as it approached for docking. He quickly got into the casket, by the side of the embalmed corpse and closed it shut. Once the freighter undocks, he would be free to get out of the casket. Every casket had an unlock provision from the inside in case someone was accidentally shut in. He was willing to endure this minor ordeal with the corpse until the freighter was on its way. The pod bay doors opened and the freighter completed its docking maneuver. The casket moved into the freighter and the doors closed. A few seconds later the freighter undocked and glided away from the Lunar Penitentiary Colony. Superintendent Jackson finished typing his report on the strange happenings that week. - OFFICER MARK RICKMAN (38/MALE), LPC RIOT VICTIM. - PRISONER #3092 JEFF RHODES (29/MALE), LPC RIOT VICTIM. CASKET A314 SENT TO EARTH. CASKET A314 DISPOSED IN SPACE AS PER NEW DISPOSAL POLICY AND COST REDUCTION DIRECTIVE 37. Selvam sat in his classroom looking out the widow. Two sparrows sitting on a branch of the mango tree in the playground were chirping playfully. The teacher was reading a passage from the Social Studies textbook. Nothing that happened around him interested Selvam. He was preoccupied with something that demanded his entire creative faculties. So, the sparrows and Social Studies had to wait. The past two hours he had been thinking about what excuse he would give this time for not finishing his Tamil homework. Ms. Malini was a tough teacher and very adept at detecting lies. He remembered how Sudhakar goofed up a few days ago. “Why didn't you finish your homework?” asked Ms. Malini. “I was out of station this weekend,” said Sudhakar. The bell rang and Selvam came back to his senses. Ms. Jaya, the mathematics teacher was explaining mean, median, mode. Lies, damn lies and statistics! The vice-principal walked into the class and Ms. Jaya stopped her lesson. The two of them walked out of the classroom and discussed something softly. Ms. Jaya returned a minute later. She closed her textbook and asked all the children to gather their belongings and assemble in a single file, in the corridor outside the classroom. “Children, we are closing the school now as we have received news that the Prime Minister Indira Gandhi had been shot dead by her bodyguards. Public transport in the city is stopped. No buses are plying. We will be taking you to your homes in groups...” She continued explaining the logistics. Selvam was not paying attention to any of that. The sparrows were still there on the tree branch, chirping merrily. Every kid grows up with a song that keeps repeating in his head. For me it was என்னடி மீனாட்சி, சொன்னது என்னாச்சு from the movie இளமை ஊஞ்சல் ஆடுகிறது directed by ஸ்ரீதர் that had memorable performances by Kamal Hasan, Rajnikanth, Sripriya and Jayachitra. The song performed by S.P. Balasubramaniam was quite popular in '78-'79 and whenever All India Radio played the song, I used to run towards the radio and start dancing. It was a favorite entertainment for all the aunts and uncles in the household. The fact that my maternal grandmother was named Meenakshi must have had something to do with it. The Police had cordoned off the area at the corner of Sutton and Main streets. The place looked like a warzone. Curious onlookers stood behind the police roadblocks trying to get a glimpse of the disaster that had engulfed their community. The red brick building which housed the Perfect Spirits liquor store in the ground floor was reduced to smoldering ruins from the fire. 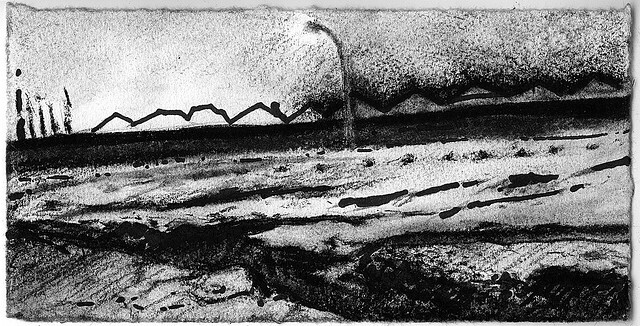 The road was coated with soot and rivulets of black water flowed down the street into the drains. My first memory of Madras is from the year 1979. I was 4 years old. I still vividly remember walking along with my maternal grandfather, mom and dad in a suburb of Madras at that time called Annanagar. The most popular landmark that everyone associated with Annanagar was the Visweswaraya Tower built in the early '70s after the 1968 World Trade Fair held in that area. Most people just call it the Annanagar Tower. The Heist – A Ten Minute Play is now available on the Apple iTunes bookstore! This play is available for royalty-free performances worldwide. The Heist – A Ten Minute Play is now available from Smashwords.com! The play is an adaptation from two short stories – The Heist and Transference – previously published on Storywheel. Regular readers of Storywheel may recall that a different adaptation directed by Hariher Balasubramaniam from Strayfactory was staged during The Great Indian Blogologues in October 2010. This is the original version of the script available for royalty-free performances on stages worldwide. You can now purchase Kindle eBooks of collections of stories from Storywheel at Amazon.com! For the convenience of readers, there are different collections available. The Storywheel Collection - Vol I consists of the first 20 stories published on Storywheel: the short story blog. The Storywheel Collection - Vol II is the second in the series and consists of another 20 stories previously published on Storywheel: the short story blog. The Storywheel Collection - Combined Vol I & II is a bargain. Get all 40 stories in one neat package. This is the best deal and has all the stories published so far. If you are a science fiction fan, the Storywheel Collection - Science Fiction is for you. And coming soon... The Storywheel Collection - Suspense. For those who like a little mystery in their short stories. I thank all readers for their continued support. Happy reading. aghavan walked to his desk dressed in a white bathrobe. He pressed a button and a monitor sprung up on his desk and lit up. It seemed to be a busy day ahead for the Minister of Transportation. Join me in expressing our prayers and hopes for the people of Japan who have been ravaged by the recent earthquake and tsunami and its aftermath. he train stopped at Jolarpettai station. Sundaram collected his bag and walked towards the exit. Porters scurried around looking for customers. It stopped raining a few minutes ago. The platform was drenched. Sundaram got out of the station and looked for the cab driver who was supposed to pick him up. He found the driver holding a placard with his name.